Which sectors will be impacted the most by the ASA's new digital remit? I spent this morning with the ASA with other brands and marketers discussing the extension of the CAP's remit into websites and digital marketing. You may have already seen the ASA’s poster campaign which highlights to people they’ll shortly be able to complain about misleading websites. That's what's going to happen; in March the authorities will be taking a much closer look at what marketers and brands are doing online. I’ve already written a piece for Econsultancy that highlights it is possible the ASA will investigate techniques deployed for SEO reasons. For example, undisclosed commercial agreements which make recommendations or make it seem as if a blogger is sharing their opinion when it’s really a script or text provided by an agency will be in remit. Those “recommended links” sidebars will become minefields in March. Perhaps what I didn’t highlight enough, given the confusion in the comments below the Econsultancy post, is that the ASA aren’t going to do anything daft like try and crawl or police the web for breaches of the rules. In fact, the CAP and ASA are being very level headed and reasonable about the whole expanded remit. The ASA make use of a complaint led process. Once a consumer complains then they’ll investigate. The Office of Fair Trading, however, is more likely to take a pro-active interest on areas that concern them – sponsored tweets being a key case in point. 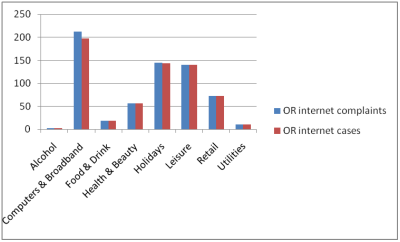 The ASA’s data shows that people tend to complain about different things when it comes to the web and compared to TV. People tend to complain about taste and decency when it comes to TV ads. If people think that scaring kids with stories about drowning pets as a way to warn people about climate change is a step too far then they complain to the ASA. That doesn’t tend to happen to the content people consume on the web. People tend to complain about misleading claims and prices when it comes to the web. If a PPC ad claims “Flights from £32” and then you discover it costs an extra £10 to book online, £5 extra to use a credit card, £50 for flight tax and £10 to bring a bag then they tend to complain to the ASA. The ASA’s been able to investigate PPC ads like that for quite some time. The new remit, which comes into place in March, means that a webpage that says “Flights from £32” will be in scope. The claim made on the site gets the same treatment. Retailer and vendors will have to think carefully about the images and text they include on their product pages. If a product picture makes you think the action figures come with the playset but, actually, you have to buy them separately then you may get complaints and the ASA may start to investigate. I’ve got some graphs provided by the CAP on the complaints they investigated December 2009 to 2010 last year. 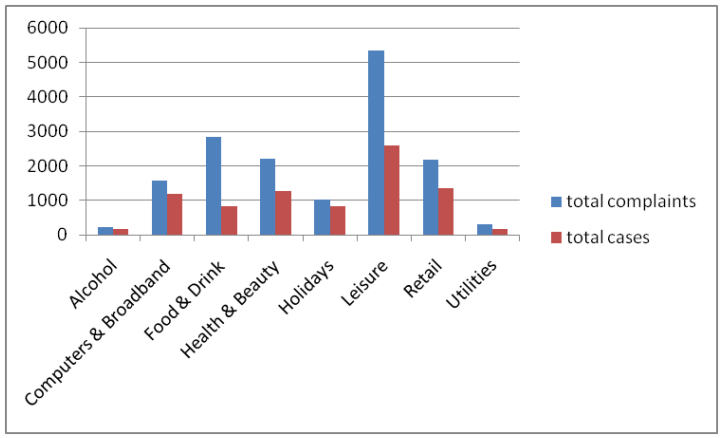 This next graph shows the complaints that came in last year but where deemed to be outside the old remit. These are the complaints that may well be inside the new remit. Compare and contrast that to the cases they had to turn away. Categories like “Computers and Broadband” are much higher. Broadband speed claims will be a thorny issue. 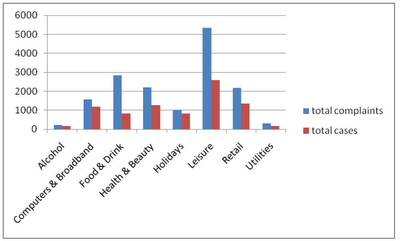 The “Holiday” sector also picks up a bit. I’m certain the way many travel companies structure their pricing increments are the main reason for this. I think this is a “time will tell” issue as it’s hard to guess just how the ASA’s advertising campaign will impact on consumer behaviour. It may well be that only a similar number of complaints come in this year. However, it’s also possible that come March extra hundreds of people are contacting the ASA with grumbles about misleading information they’ve spotted online either on sites, mobile apps or ads.